I have a new ‘thing’… I’ve suddenly started to get crippling migraines. And they are coming every other day right now. With that in mind, I chuckled to myself when trying to think of any good things to write about this week. But isn’t it amazing, that once you start to think, you realise that lots of lovely things happen each day, but sometimes, they can be overshadowed by negativities. That’s why I love joining in with Happy Days each week – it makes you focus on the positive and be grateful. The doctor prescribed some drugs that seem to be stopping the migraines in their tracks if I take them as soon as my vision starts deteriorating. They leave me a bit zombie-like, but that is hugely preferable to the pain, especially when I’m on my own with Lottie. My sister invited my mum and I over to hers for lunch and we had a really lovely few hours catching up and playing with Lottie. We got Lottie a gorgeous new coat in the sale to last her the rest of winter. That baby grows so quickly! On Friday, I took Lottie in to see my colleagues at work and she was an angel. Last time I took her, she’d had her jabs that morning and I didn’t realise how poorly she would be, so she screamed for the entire time we were there, so it was really nice for them to meet my happy baby. On Friday night, Mr M and I ordered takeaway pizza and had a really lovely evening together with no TV, just chatting and being us – something that’s a bit of a rarity nowadays, so extra special when it does happen. 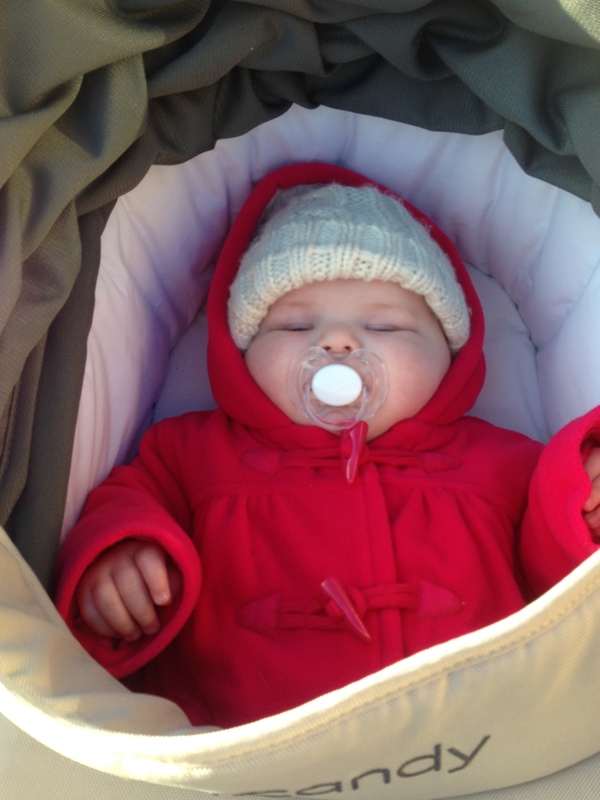 Lottie and I went out for lunch with a friend yesterday and again, she was impeccably behaved. She is a real joy to be around and is really good company, smiling and laughing at everyone and entertaining herself with toys and people watching – she’s a nosy little thing and loves to watch what’s going on. I lost another pound in weight – it’s not much, but it’s still going in the right direction. That gorgeous winter sunshine has peeked it’s head around the corner every now and then – such a welcome break from the rain. It’s nearly February – one step closer to spring. You see? There are always happy moments in our days, we just have to look a bit harder to find them sometimes.